Much more in the full review – recommended – here. MacDailyNews Take: We’ve got a feeing that the iPad Pro (with iOS 10 and a bit more time in the oven for some of our required apps) has a strong chance of displacing the MacBooks in our backpacks for on-the-go computing. Until then, we can hardly wait to see what Apple does with the next-gen MacBook. I bought the wifi only version and returned it, bought the cellular version instead, as I had forgotten that TomTom, which is why I bought it, requires the cellular version. TT works with or without the sim card installed, but a sim card is free at the Apple Store, and even if you don’t use it the message “No sim card installed” does not appear. If you already have an iPad Air2, you might be able to get by with the 32 GB version at a considerable saving. Just curious…..how do you get by with the 32GB version if you have already have an iPad air2? I was thinking of doing this somehow. I am struggling with the “somehow” part right now. But if you got it figured out ……. Does it work with a Sinclair or Amstrad too, all gibberish to me. Indeed. A special-purpose computer, not a general-purpose one. Oh I am certain this is the future for the general consumer. It’s the computer for the masses. The only reason Windows got traction was because it was the cheapest option that begat the biggest consumer ecosystem. And Android and iOS took that mantle away a long time ago and it is never going back. Windows and OSX are now relegated back to work specific tools for certain trades. Enterprise and niche trades. And even Enterprise will slowly drift away leaving only niche trades to try and survive on it. I got the 128GB with cellular, also to have the GPS receiver for maps. Maps on this big portable screen is truly a completely different experience than on a normal iPad. With the big screen and speed it is like looking out an airplane window. I have spent hours, many of the last 24 hours using it and I am soooo happy with this iPad Pro. It certainly has never felt too big for me. The screen is about perfect, seems like I am looking at a letter size piece of paper, or a full size magazine. The weight is actually less than some of my professional magazines, and a lot less than most text books or references. I am guessing that anyone who thinks it is too big either hasn’t used it or isn’t a pro so doesn’t see the potential. I can’t wait to get the Pencil! No visible file system, no replacement of the real computer. A nice toy for consumption. I have an iPad Air and like it very much. Use it everyday. Cloud based storage is no replacement for a locally managed file system. Long live the Mac and Mac OS. Oh FCOL is nice but stop making it’s sound like its a revolution. It’s 3 inches bigger diagonal with a more powerful chip like we get every year. WOW! 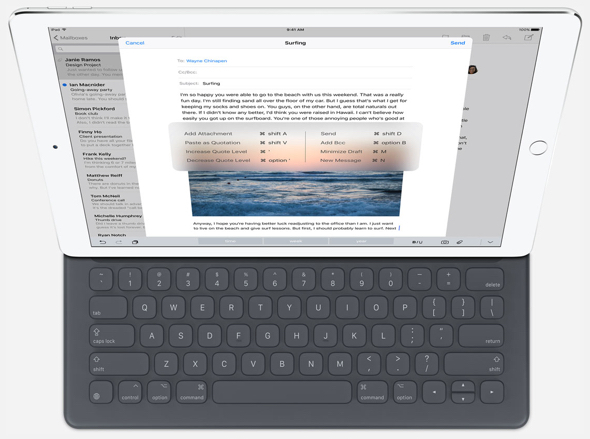 A larger iPad was a no brainer, anyone who really thought it would end at 9.7″ was pretty naive.